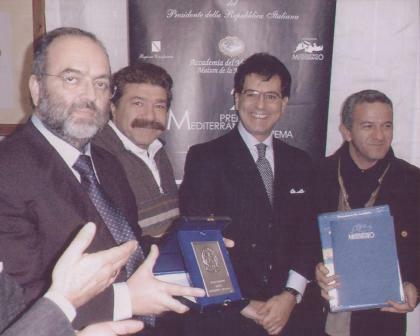 The Mediterranean Award for Cinema 2003, for the section Venice Screenings of the 60th International Cinematographic Art Exhibition of Venice, was awarded to the film “Il Natale rubato”, director Pino Tordiglione, subject and script by Pino Tordiglione in collaboration with Nicola Vegro. The reason for award is the following: the film represents and expresses the Mediterranean culture and art through the language of cinematographic communication, emphasizing human values in its contents. The award was selected by anonymous experts who participated in the showing of the features presented at the Venice Screenings, with the aim to award a prize to the films beinh in synergy with the motivations and aims of the Fondazione Laboratorio Mediterraneo of Naples. The special award was given by the President of the Foundation, Arch. Michele Capasso, and by Mr. Vincenzo Siniscalchi, at the Central Office of Maison de la Méditerranée – Accademia del Mediterraneo in Naples, and was preceded by the projection of the film.